Policy & Politics held its 2013 Conference in Bristol on the 17-18 September at the Marriott Hotel, Bristol. The theme of this year’s conference was ‘Transforming Policy and Politics: the Future of the State in the 21st Century’. Details can be found on the conference webpage. 160 scholars from eighteen countries discussed different aspects of public and social policy in relation to recent and future changes to the state, politics and public services. Discussions were focussed at a global and local level in a range of sectors, including health, housing, welfare and economic development. The conference hosted four fantastic plenary speakers: Professors Liesbet Hooghe (University of North Carolina), Bob Jessop (Lancaster University), John Keane (University of Sydney) and Eva Sorensen (Roskilde University). The plenary speakers drew on examples from around the globe to illustrate recent transformations to the state and their implications for policy and politics. Panel sessions included world leading scholars in their fields with many discussions leading to plans for future work, including joint or group publications. The conference was also well attended by postgraduate students who made valuable contributions to the plenary discussions and panel sessions. Indeed, one of the highlights of the conference was a paper presented by an early career academic, Zachary Morris (University of California-Berkeley, USA) who presented work from his Master’s thesis titled ‘Disability policy reform in the United States and Great Britain’. Conference delegates described Zach as a ‘rising star’. The theme of next year’s conference is ‘The challenges of leadership and collaboration in the 21st Century’. It will be held on the 16-17th September at the Marriott Hotel, Bristol. Our plenary speakers are: Professors Chris Ansell (University of California, Berkeley), Erik-hans Klijn (Erasmus University), Helen Sullivan (University of Melbourne) and Jacob Torfing (Roskilde University). 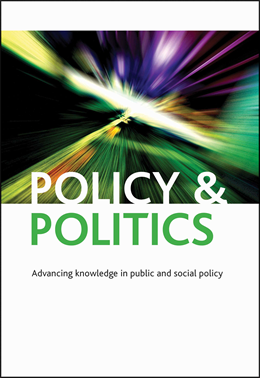 We will also be announcing the winners of two new Policy & Politics prizes for ‘Best Paper’ and ‘Best Paper from an Early Career Academic’ published in the Journal. We hope that colleagues will once again join us for a superb academic event.